For a growing company, one-to-one support simply doesn’t scale. Self-service support helps keep costs down by maintaining headcount, allowing customers to self-assist on simple questions, and freeing agents for more complex issues. 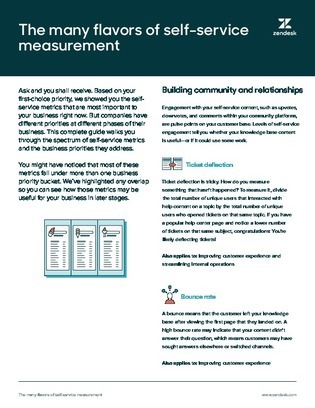 Download this white paper to learn about the spectrum of self-service metrics and the business priorities they address, and find out how you can build a community with better customer relationships.